Online fakes are a big business thanks to the popularity of sites like Amazon and eBay. 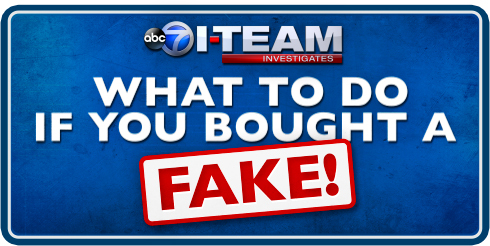 CHICAGO -- Online fakes are a big business thanks to the popularity of sites like Amazon and eBay. Scammers take advantage of the convenient marketplace to trick customers into spending their hard-earned money for counterfeits. Online fakes are a billion-dollar-plus business, according to a recent government report. Some of the fake items get seized and can be a threat to consumers. From high end beauty products to electronics, if a company makes it chances are there's someone else who fakes it. Do you really know what's inside your shampoo, or perfume bottle. The owner of George's Salon in Gold Coast said his vendors have sounded an alarm to people who think they may find a better deal online. "A lot of the times, the products are expired or they have been exposed to extreme temperatures, and worst case scenario it's not even the product they say is in the bottle," said George Gonzalez. The I-Team wanted to see what some of these fake products looked like, so consumer reporter Jason Knowles went to the Los Angeles area to visit The Counterfeit Report. "Manufacturers do retain us to scour the internet and websites and remove counterfeit and fake products," said Craig Crosby, founder of The Counterfeit Report. Crosby said many are manufactured in China. Some may be obvious, like when a battery says Duracell, but its packaging does not. But most look so real, like counterfeit Marc Jacobs perfume. "If you look closely you'll see the counterfeit has a seam in the bottle on the side," Crosby said. Crosby said he spots fake MAC makeup by looking closely at the "A" in the logo. In the real one, the A has a gap in it. "In the fake one the A actually connects," he said. This year the U.S. Government Accountability Office found that 42 percent of goods sold from third party sellers on the most popular websites were counterfeit. Crosby said some products may not even exist in the manufacturer's line, like counterfeit Lamisil anti-fungal soap and gel. With those kinds of fakes, you have no idea what's in it and yet are putting it directly on your skin. "Yes, expecting over the counter drug-type results," Crosby affirmed. Also completely fabricated: $400 Monster "Tron" movie headphones. "The packaging is excellent - multiple layers of packaging - but it doesn't exist in Monster's product line," he explained. The I-Team recently found the headphones and the counterfeit Lamisil on eBay, who said they pulled all the items after the I-Team alerted them. eBay also said in 2017 "just a fraction of a percentage point" of its items have been identified as counterfeit, and if someone purchased a fake item the company's money back guarantee "applies to virtually all transactions and will cover them accordingly." eBay and Amazon both say they aggressively combat bad actors. But Crosby showed the I-Team current Amazon listings of several items he said are fake, mostly because, he said, they do not exist in the manufacturer's authentic product line. That includes flashlights and fake law enforcement badges he purchased. "It is a replica of a United States Secret Service Badge," Crosby said. Crosby also showed the I-Team receipts, saying he purchased a package of counterfeit razors and some memory cards from the online retail giant. "You will see them branded all the way to 64 and 128 GB. When they get to real capacity they just erase your data and override it so you lose everything on the card," he explained. Amazon said that customers should trust that "they will receive authentic products, and we take any claims that endanger that trust seriously. We strictly prohibit the sale of counterfeit products and invest heavily...to ensure our policy against the sale of such products is followed." And "...We remove suspected counterfeit items as we become aware of them." "Consumers should know what they are buying, and they should become more aware, with the volume of counterfeits out there is a real risk. If you have to ask 'Is this item authentic,' I would shop elsewhere," said Crosby. So what do you do if you want to buy online? The first red flag is a price that looks too low, although some counterfeiters are now raising their prices to make their sale more realistic. You can also bring a product to an authorized retailer one time and compare it with the product on the shelves, or call the manufacturer with questions. You can also buy online directly through the manufacturer. Our customers trust that when they make a purchase through Amazon's store-either directly from Amazon or from one of its millions of third-party sellers-they will receive authentic products, and we take any claims that endanger that trust seriously. We strictly prohibit the sale of counterfeit products and invest heavily-both funds and company energy-to ensure our policy against the sale of such products is followed. Our global team is available 24 hours a day, 7 days a week to respond to and take action on reported violations and notices of potential infringement. In order to detect bad actors and potentially counterfeit products, we make significant investments in machine learning and automated systems. We employ dedicated teams of software engineers, research scientists, program managers, and investigators to operate and continually refine our anti-counterfeiting program. When a business registers to sell products through Amazon's Marketplace, Amazon's systems scan information for signals that the business might be a bad actor, and Amazon blocks identified bad actors before they can offer any products for sale. Amazon's systems also automatically and continuously scan numerous data points related to sellers, products, brands, and offers to detect activity that indicates products offered might be counterfeit. Over 99.9% of all Amazon page views by our customers landed on pages that did not receive a notice of potential infringement. We also work closely with vendors, sellers, and rights owners to strengthen protections for their brands on Amazon. Any rights owner can enroll in Amazon's Brand Registry to manage and protect their brand and intellectual property rights on our store. More than 40,000 brands are enrolled in Brand Registry and are using our free service to better protect their brand and control product information displayed on Amazon-this means brands can ensure their information is accurate and customers can make confident, informed purchasing decisions on Amazon. We encourage rights owners who have product authenticity concerns to notify us; we investigate all claims thoroughly. We remove suspected counterfeit items as we become aware of them, and we permanently remove bad actors from selling on Amazon. Amazon investigated and took action on 95% of all notices of potential infringement received from Brand Registry within eight hours. With our proactive innovations that learn from the information in Brand Registry, brands in Brand Registry on average are finding and reporting 99% fewer suspected infringements than before the launch of Brand Registry. We have also successfully taken legal action against bad actors and will continue to pursue litigation and work with law enforcement where appropriate. Customers are always protected by our A-to-z Guarantee, whether they make a purchase from Amazon or a third-party seller. If the product doesn't arrive or isn't as advertised, customers can contact our customer support for a full refund of their order. Customers trust that they will receive authentic goods when they shop on Amazon and anything that diminishes that trust is unacceptable. Counterfeit is an age-old problem, but one that we will continue to fight and innovate on to protect customers, brands, and sellers. "Consumers can shop eBay's 1+ billion items with confidence, knowing we have key partnerships and processes in place with rights owners, law enforcement and government officials to ensure a safe shopping experience." - More than 40,000 rights owners participate in eBay's VeRO program. Launched in 1998, VeRO allows brand owners to quickly and easily report possible counterfeits or other infringing goods. Additionally, if a shopper believes an item may be counterfeit, we allow them to "Report a Listing" at any time. The listing will then be reviewed promptly by eBay. - In the rare case a buyer believes that he or she has purchased a counterfeit item, eBay's Money Back Guarantee applies to virtually all transactions and will cover them accordingly. - We have closely reviewed the items you sent to us and have removed them from our marketplace. Each of the product manufacturers for the items you sent to us participates in our VeRO program. We provide a direct line of communication into eBay to report items that infringe on their Intellectual Property rights - and we take prompt action. This has proven to be a very effective program in our efforts to combat counterfeits.